Located three and a half miles South of Tyler, Texas, in Noonday, Texas, the Noonday Onion Shed grows and ships what some call the sweetest onions in the world. 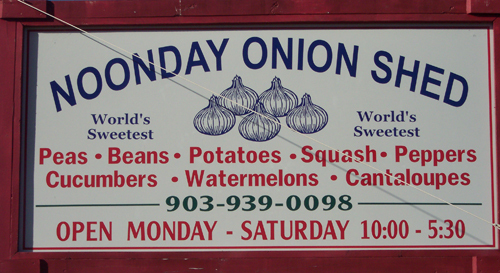 The Noonday Onion Shed was established in 2004 by David Claiborne and his son, Austin. It is open year round and sales a variety of homegrown vegetables, but the Noonday Sweet Onions are always our top seller. We our currently in the process of restocking our store. Onions will be available for purchase at the Onion Shed and online after May 24th.